A successful birding adventure tends to include a fair bit of planning. It’s needed if “success” is synonymous with seeing a higher percentage of target birds (even if that just means any possible species), the trip being rather glitch free, and having abundant coffee available at all hours. I mean, really, for the birding trip to make the grade, first and foremost, you have to make sure that 1) either every lodge has some form of 24 hour coffee availability, or 2) you can fit your own coffee making device into the luggage. If it’s high quality coffee, the trip is that much better (and yet another reason why Costa Rica is awesome)! 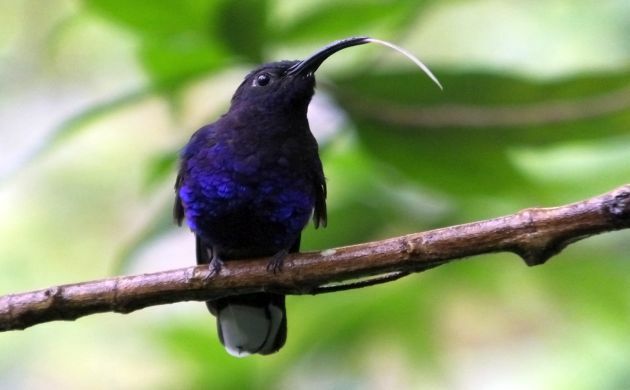 Although those who don’t partake in the juices of the magic Ethiopian bean don’t have to worry about that essential bit of planning, such birders still need to think about where they are going to see Violet Sabrewings, where to eat and drink, and safe places to sleep when not searching for owls. Thankfully, not all trip planning involves a tedious pouring over of satellite maps on Google Earth, checking eBird lists, and wondering if the reviews on TripAdvisor can be trusted. The fun part of trip planning involves the main reason why we wait in lines to take flying metal tubes to places where we might not know what the heck anyone is saying. It really is all about the birds and that’s why we spend hours of wondrous anticipation gazing at field guides, online images, and videos. Whether we have someone guiding us or not, we still need to prepare ourselves to identify dozens, or even hundreds, of unfamiliar birds. If the families are the same, that might not be too much of a problem. If they are different, though, it’s a whole new tropical ball game. 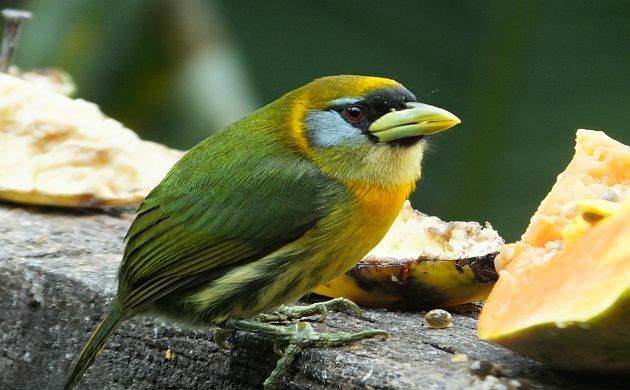 Prong-billed Barbet- not found up north. In fact, some of those new birds look so radically different, we can’t help but wonder if they are real. Logic tells us that yes, that hornbill, toucan, or Picathartes does exist but they look so damn bizarre, it can still be sort of hard to believe. And perhaps, at the end of the day, that’s why some of us travel to distant lands to wake up before dawn, make the coffee while stumbling around in the dark, sweat buckets, and brave exotic biting insects. 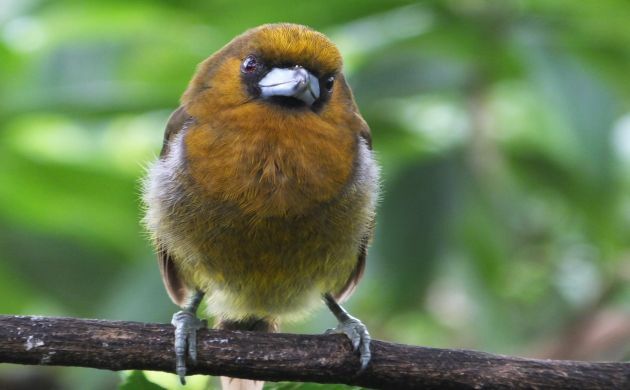 We just might have to prove to ourselves the existence of such weird and wonderful birds and what better way to do so than venturing into beautiful tropical forest habitats where we are surrounded by the intriguing sights and sounds of “new” birds. 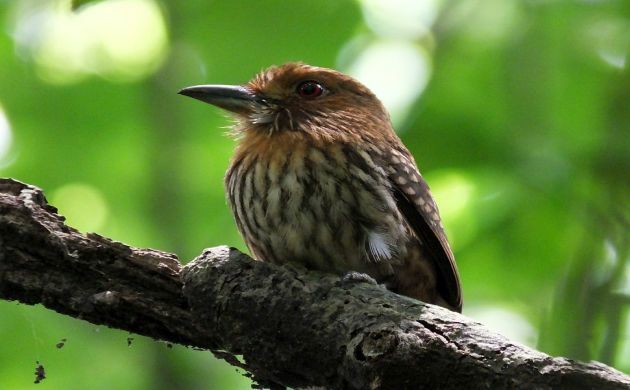 One such group of birds that leaves many a neotropical novice on the precipice of doubt is the Bucconidae or puffbirds because let’s face it, the name of the family sounds silly, and when you see a picture of one, it really kind of looks like a muppet or some plush toy. The Red-headed Barbet might also pass for a puppet. Don’t feel ashamed if you find yourself wondering how they can have such over-sized heads, big old beaks, and stumpy, almost rectangular bodies. Supposedly real but how? What do they do? Do they puff? How do they exist? How can you see them? 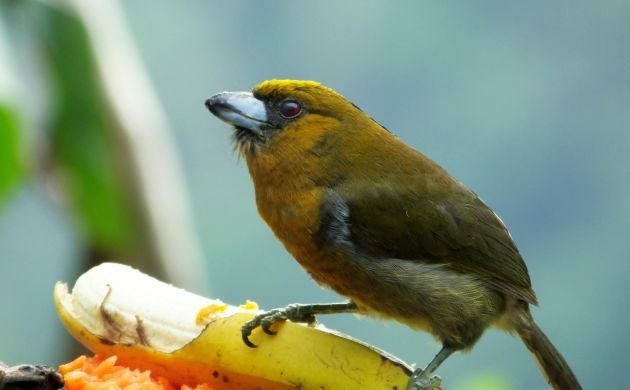 Where do those White-necked Puffbirds live?– Lowland forest, up in the tops of the trees but not only in rainforest. Watch for these ones along rivers and even in dry forest, they are especially frequent at Ensenada Lodge and various sites in the southern Nicoya Peninsula. 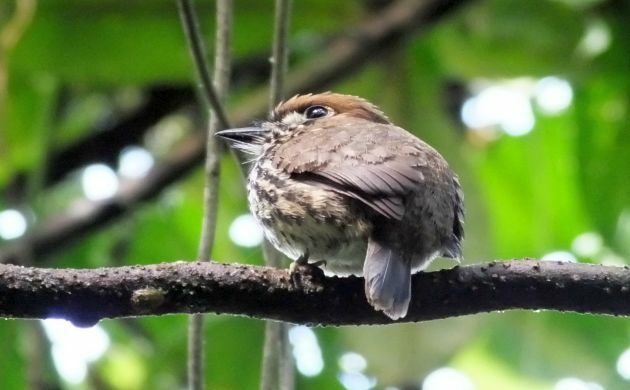 How about White-whiskered Puffbird?– Watch for the brown, feathered puppet in the understory of lowland and foothill rainforest. Although they live in a lot of places, Carara seems to be especially good for this thing, and yes, they do have white whiskers. 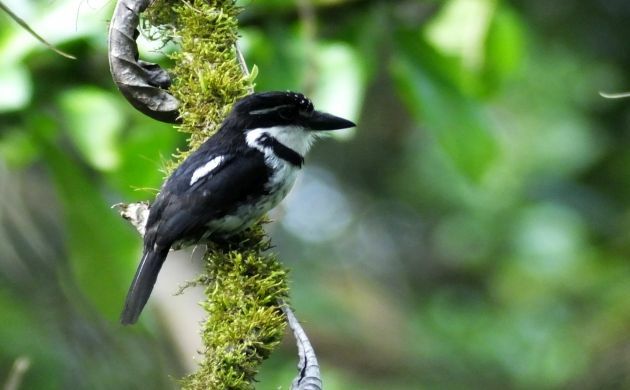 Pied Puffbird?– The miniature black and white puffbird is more the size of a tanager than a thrush. 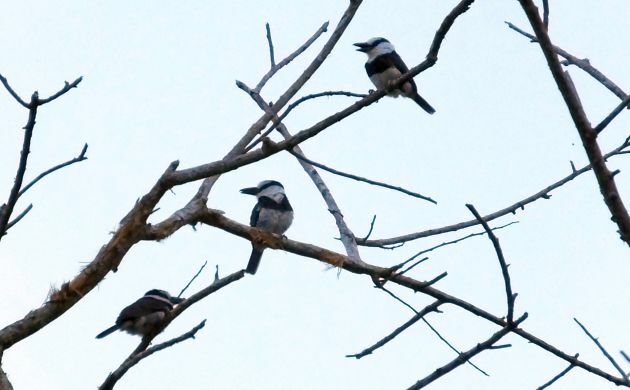 Check the treetops in the Caribbean lowlands, learn the song, and watch for a small, black and white thing perched far overhead. 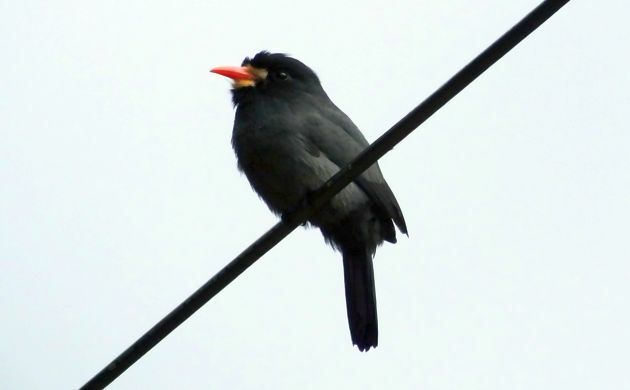 White-fronted Nunbird?– Although checking eBird helps with this one, if you go birding in quality rainforest on the Caribbean slope, you might find them. Yes, the beak really does look like that! Lanceolated Monklet?– Saving the most unreal of the bunch for last, the unfriendly, hermit-like antics of this wily little character make seeing one far from guaranteed. However, if you go to the right spots, you do have a chance at seeing this weird little grail bird. If not, don’t worry, you won’t be alone in wondering if the bird is actually a myth. The answers to these questions are, “Avoid driving during rush hour.”, “Take a close look at the tail.”, “Great Black-Hawk.”, and “Yes, I think so.” Enjoy the planning of your trip, and yes, puffbirds actually are real!